After our 2 days in Mackinaw City, our first stop on the journey south was Charlevoix! 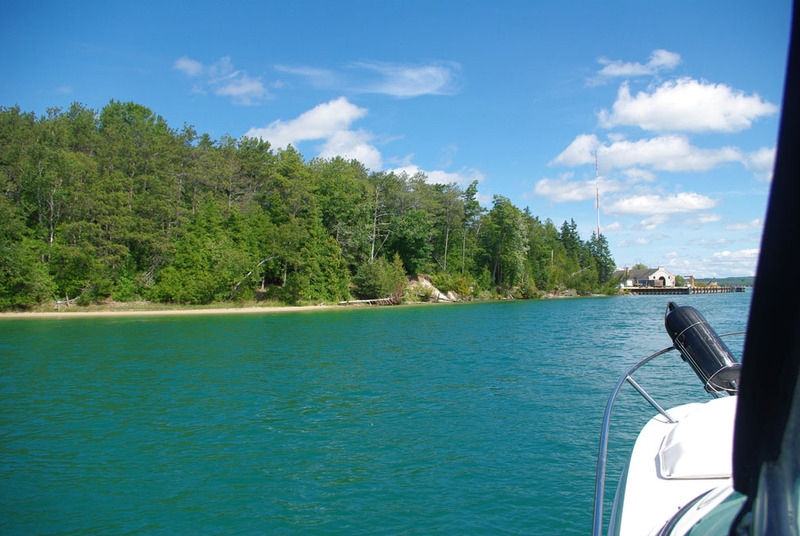 This was the day we had originally scheduled Charlevoix on our itinerary, it was just luck that we ended up there 3 days last week! We had a pretty rough ride south on the lake, and although the trip went by quickly, we were very happy to pull in to port, just 2 slips down from where we were before. It was a 90 degree day, so all we wanted to do after our boat trip was swim! We cruised around Lake Charlevoix for a bit, and settled into a small shallow cove, where we dropped anchor. We pulled out the snorkel gear and had some fun swimming around in the crystal clear water. It was a bit colder than at home, about 71 degrees, but it was comfortable. Ben also used this opportunity to give the boat a much needed scrubbing. Once we arrived back at our dock, we made friends with the couple in the boat next to us, Chad and Allie. They were vacationing with their two daughters, ages 1 & 3, in their Sea Ray Sundancer 250 that they trailered up from Grand Rapids. After the girls went to sleep, we hung out on their boat with a few cocktails and Michael Bublé. :-) A perfect end to our time in Charlevoix. Happy travels the rest of the summer guys!